You love taking care of your family – watching your kids grow, deepening your relationship with your spouse, and helping keep an eye on your parents as they get older is one of the best jobs around. But there’s one aspect of caregiving that you wish you could simplify – the dentist. It’s inconvenient to drive around to different offices and keep track of appointments that are scattered throughout the year. But, with the team at Ascot Aesthetic Implants & Dentistry, your premier family dentist in Fayetteville, you can knock out the professional oral healthcare your entire family needs in one visit. Find out how in this post. 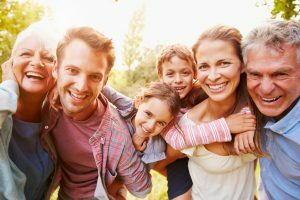 How Does Ascot Aesthetic Implants & Dentistry Provide Care For My Whole Family? As the most respected dentist in Fayetteville, Dr. Angela Ruff loves taking care of patients or all ages. She understands how difficult it can be to see multiple providers for dental care, and offers the following age-specific services to maintain the oral health of your whole clan. Since kids are especially prone to tooth decay due from being inundated with sugary foods and beverages, and developing hand-eye coordination, Dr. Ruff knows that dental issues can arise as soon as teeth show up in the mouth. With regular exams and cleanings, dental sealants, and education, we can set your children up for a lifetime of dental success. What Adult Dental Services Do You Provide? Adults usually face two common dental problems – tooth decay and gum disease. By the time a patient is an adult, most will have had at least one cavity, and half of patients will deal with some form of gingivitis or advanced gum disease. Aside from offering complete, comprehensive care, we can maintain your oral health with fillings, medicated mouthrinses for the earlier stages of gum disease, and even root canal therapy that ends dental pain. What Senior Dental Services Do You Provide? As people age, teeth are subject to general wear and tear, and seniors can deal with issues like dry mouth, periodontitis (advanced gum disease), tooth loss, and even oral cancer. And, many systemic diseases that seniors face, like diabetes, can impact your smile. With regular oral exams, we can diagnose over 120 medical conditions, provide solutions for dry mouth, prevent oral cancer, and replace missing teeth with durable, life-like dental implants. Now that you know how convenient we are by being your one-stop family dental care shop, schedule your appointment with Ascot Aesthetic Implants & Dentistry today!